It must’ve of been a total change when they joined the WACs.I can’t imagine their struggle to maintain the social view of femininity and also carry out their military duties. I hadn’t realized what connection with the military that Chattanooga had. Me, too. Until I started doing research for this blog I had no idea that a major military base in Georgia was just across the state line from Chattanooga. And a hair cut to suit her cap! Basic training with glossy finger nails? Wonder how that went…. “…the kind of loveliness they need for wartime careers” is such an odd phrase. Wonderful! I just read the previous post as well, and I love that the community came together for these women. It must have given them so much support and encouragement! 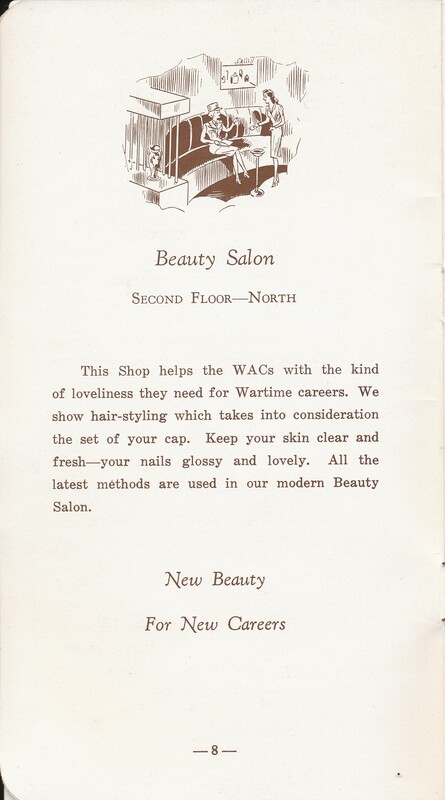 I,too, love the phrase “loveliness for wartime careers”. I’m loving these posts, Sheryl. I’m glad you like them. It does seem like the community was wonderfully supportive of the WACs as they went through boot camp. Actually, this isn’t so strange, once I thought about how many of the WACs were being trained for jobs which would release men for fighting. And of course, it’s good marketing on the part of the store as well as a nice support for the women. I suspect more than a few were worried about what those caps were going to do to their hair. I had similar thoughts about it being good marketing. I read somewhere that some of the women who joined the WACs felt really bad that a man who previously had a desk job might be sent to the front because they joined. Yes, it was probably hard to find a good hairstyle to match the uniform. I bet that getting their hair done made them feel pretty and special. They probably needed a morale booster after enduring the obstacle course. I love it, too. That store must have had a very skilled person writing ad copy. absolutely surreal… and like you, enjoying the booklet! That phrase about “wartime loveliness” is going to haunt me, I think! It’s so . . . odd. But the store was making very clever marketing decisions, I think–everyone was just trying to figure out this new reality! Yes very smart marketing attempt on the stores part – wonder how successful it was? I bet she did, too. For some reason, I can picture her getting a perm there. Love this! My how times have changed and yet, in many ways things have remained the same. How true–Women have always wanted to look nice. It’s intriguing to think she might have had a beauty appointment there. We’ll never know for sure whether she had her hair done there–but it’s definitely within the realm of possibility. My daughter is in her high school NJROTC program and grooming in uniform is part of their grade on a weekly basis. The difficulty for the females is their hair. If you have long hair you can pull it back in a chignon or if you have really short hair you don’t have to do anything other then have it nicely groomed. It’s when your hair is in between like a bob or something else above the shoulders that you don’t have enough hair to pull back and too much to leave alone. My daughter changed to a short hair style because her length was too difficult. Thanks for sharing this information. . . I hadn’t thought about how some hair lengths are more difficult to keep well-groomed. I bet the WACs also had to meet certain grooming requirements.